The Museum needs your help! Legend has it that a Spanish ship loaded with a fortune of gold went missing somewhere in the Caribbean and was never found. This lost treasure is referred to by locals as the ´Caribbean Secret´. 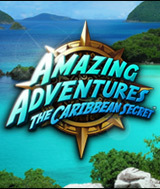 Explore 25 amazing Caribbean locations finding over 2,000 cleverly hidden objects and playing 8 unique mini-games to recover the Secret Treasure! Find over 2,000 hidden objects in over 100 levels. Explore 25 stunning Caribbean locations. Play 8 unique mini-games including Spot-the-Differences, Match-3, Jigsaw and many more. Three game modes: Find the Secret Treasure, Unlimited Seek & Find, and Unlimited Match-3. Comments: The graphics in this search and find game are very good. I also liked the mini games which give you a change in pace from the search and find. If you like this type of game, this is a very good one to play. Comments: this is one of my favorites, hidden object games are my first choice when it comes to game play. I have enjoyed most of what verizon has to offer. this one has cool mini games, great great graphis and it is not just a quick get it over with game it actually last a decent amout of time. so this game is a must if you like the hidden object games.